This substantial salad features a lovely combination of sweet and earthy flavours – apples and parsnips are such good partners. The garlicky dressing adds a little piquant edge and the nuts finish the whole thing off with a welcome crunch. Preheat the oven to 190°C. Peel the parsnips, quarter them and remove the woody cores, then chop them into roughly 2cm pieces. Put the parsnips on a large roasting tray (they should not be crowded), scatter with some seasoning and toss with the oil. Roast for 10 minutes, then take them out of the oven, give them a stir, add the apple pieces and return to the oven for about 15 minutes or until everything is tender and golden brown. Meanwhile, make the dressing by whisking all the ingredients together. Check the seasoning. When the parsnip and apple pieces are cooked, transfer them to a bowl and toss them in the dressing. 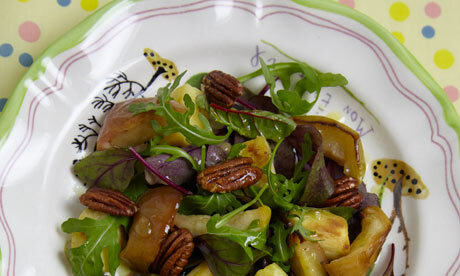 Arrange the salad leaves on four plates, top with the warm, dressed parsnip and apple, then finish off with the toasted nuts. Serve straight away. This entry was posted on February 27, 2011 at 3:47 pm and is filed under Food with tags apples, baked, black pepper, crushed garlic clove, dressing, english mustard, hazelnuts, honey, hugh fearnley-whittingstall, lemon juice, parsnips, pecan nuts, rapeseed oil, recipe, roasted, salad leaves, salt, walnuts. You can follow any responses to this entry through the RSS 2.0 feed. You can leave a response, or trackback from your own site.